Every community has vacant or unused properties that are the result of abandonment, foreclosure, a death in the family, or out-of-state owners who chose to stop maintaining them. Those buildings are the property of the city or county in which they are situated—though they no longer yield tax revenues and often end up being quite costly. That is because the city or county has to maintain the property by cutting the grass, clearing garbage off the lot, or even razing uninhabitable buildings. What’s more, these lots are typically eyesores and a detriment to economic development—especially if they are located in low-income neighborhoods. Although cities are not generally in the real estate business, they encourage development, growth, and prosperity in all sectors of their jurisdictions. To this end, the City of New Bern, North Carolina, created a website that, with the help of GIS and an Esri Story Map app, informed small developers, first-time home buyers, and lower-income populations about affordable city-owned properties for sale. 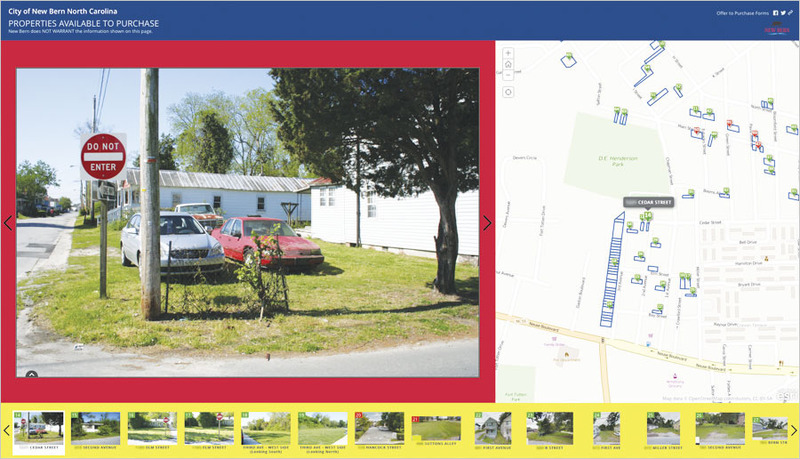 New Bern's GIS team released a website in October 2015 called Properties Available to Purchase, which uses the Story Map Tour template as its foundation. In 2013, New Bern received a Choice Neighborhood Initiative (CNI) grant from the US Department of Housing and Urban Development to revitalize a commercial district and some adjacent, lower-income residential neighborhoods. The purpose of the grant is to bring together residents, businesses, nonprofits, and service organizations to plan how to improve an area in ways that enhance residents’ lives. Among the key indicators that the city used to determine the state of the area were vacant properties and abandoned buildings. In early 2015, New Bern reexamined the neighborhoods that would benefit from the grant to figure out what to do about this all-too-common and constant issue. The city had GIS data and information on ownership, which showed that many of the vacant properties were already city owned. This sparked discussion about how New Bern could use these properties to promote development by others or in conjunction with the city. From a long-term planning perspective, the city was determined to provide better affordable housing, encourage economic progress, and help people feel more of a sense of place in these neighborhoods. While this would be challenging due to shrinking budgets and a relatively tenuous economy, those involved in the CNI grant realized that the unused properties could play a key role. New Bern’s primary plan was to build up the area to better provide for the community. The city wanted to work with small developers and housing organizations to establish community spaces and construct affordable housing on some of the unused lots. It also wanted to encourage first-time home buyers and lower-income populations to transform these abandoned houses into homes. To begin to put this idea into action, New Bern’s GIS department was tasked with seeing whether GIS tools could play a role in making information about these properties available to the public—not just in and around the CNI grant area but also across the entire city. GIS staff members met with various city departments to weed out properties that New Bern could use for future parks, green spaces, storage areas, or utility needs. That left more than 150 available properties. Their total tax value—which the city was not receiving—was deemed to be more than $2.4 million. What’s more, the city was spending, on average, $120,000 each year to maintain these properties—mowing the lawns, clearing junk, and boarding up and demolishing uninhabitable buildings. 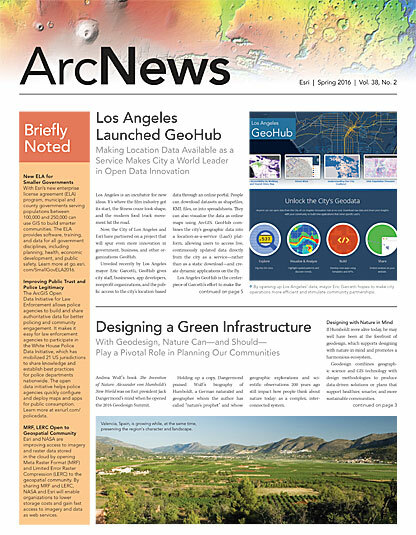 Using the story map, small developers have located and purchased properties—including abandoned lots and unoccupied buildings—and are improving them. With all this information in hand, New Bern’s GIS staff saw an opportunity to use Esri Story Map apps to reach out to the public. The staff had never used these before, so they had to learn some HTML code on the fly to link county tax information with images of the properties. But after that—plus some database construction and photography work—New Bern’s GIS team released a website in October 2015 called Properties Available to Purchase, which uses the Esri Story Map Tour template as its foundation. After just a few months, the work has paid off. The City of New Bern has sold or transferred ownership of eight lots, and seven more are in the process of being signed over to new owners. Because the city received multiple offers on some lots, for the first time in its 305-year history, New Bern has had to exploit the upset bid process, wherein people have 10 days to put a higher bid on a property that has already been sold. Small developers have purchased some of these lots and are putting people to work, renovating the unoccupied buildings or constructing new homes there. The city’s housing authority is also negotiating to purchase a handful of other vacant lots to use for low-income housing. One goal is to have tenants from older public housing apartments move into detached homes to help them achieve more of a sense of ownership in where they live. The lots are generally being sold for significantly less than their assessed value, which makes home ownership in the area affordable. And in addition to being absolved of having to take care of the sold lots, the City of New Bern is finally receiving tax revenues on these formerly fruitless properties. Impoverished neighborhoods in the area are striving for economic growth by planning new housing projects and working with various organizations—such as Habitat for Humanity and Veterans’ Community Gardens—to fix up some smaller lots and support infill development, which advocates cultivating existing buildings and lots rather than championing further sprawl. New Bern’s GIS staff is still amazed at how easy it was to start with a simple concept and develop a robust website that uses a clear, comprehensible story map to do exactly what the city wanted to do: raise awareness about available vacant properties and sell them to foster economic development in decrepit areas. The website averages more than 20 visitors per day, and elected officials and neighborhood leaders keep receiving positive feedback from citizens who are anxious to purchase properties that previously seemed out of reach. See New Bern’s Properties Available to Purchase story map.